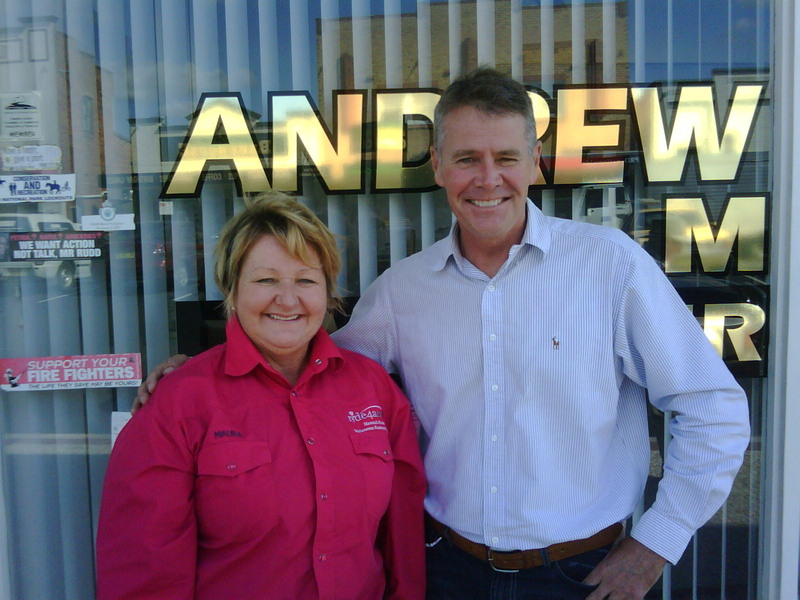 ride4acure’s first meeting for the day was in Kempsey with State MP Andrew Stoner. Andrew is very supportive of ride4acure and is keen to help where he can and intends to mention ride4acure and the issue of adolescent melanoma in parliament. Andrew has always been involved in the local community and over the years as I’ve taken my kids to compete at horse events I have seen him at many of our local rodeo’s, campdrafts and shows. Other news is that Fr Peter Richards from Kempsey is coming on the 18th to Willawarrin to do a ‘Blessing of the Trek Crew”! Fr Peter has been very supportive of ride4acure since the outset in 2009 where through his connections with Rotary networked across NSW for me linking me with groups en route with the bike ride and doing the same again with the horse trek. I’m thrilled that Fr Peter can make time to do the Blessing on the 18th, he also is a keen horseman and has for the last few years hotly contested with Joe (my 11 yo son) in the heavy horse classes at Kempsey Show. I have to say because I have snavelled Billy off Joe to do the trek this is the first year Joe won’t be competing in the heavy horse classes and his coveted ‘quietest pony’. Joe has won it for the last 3 or 4 years showing off Billy’s many skills as a quiet and patient horse. Joe has frequently had some big money offers for his beloved Billy (mostly off old timers who truely appreciate the nature of this wonderful horse), but as Joe say’s, “Mum I wouldn’t sell him even if they offered me a million bucks!” So i feel very priveleged that Joe is lending me his horse to be my pack horse and he’s missing competing at Kempsey Show and a chance to yet again defend his continuing win with Quietest Pony! This entry was posted on Friday, April 9th, 2010 at 1:41 am	and is filed under General. You can follow any responses to this entry through the RSS 2.0 feed. You can leave a response, or trackback from your own site. Sharon Campbell here from school days. amazing at what you are achieving . I was so sorry to hear that you had lost your daughter. I could drop you a line. Hoping you receive this and we can keep in touch.